Why Choose a Summer Camp with Swim Lessons? 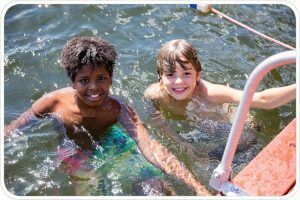 What makes a summer camp with swim lessons the right choice?We believe that water safety skills are an important lesson for everyone to learn. 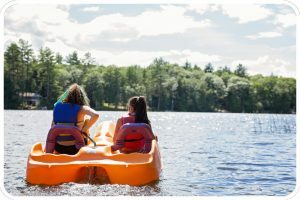 No matter where you live, you (or your children) are likely to have access to a lake, pond, pool, river, or ocean, and we want to make sure that our campers understand water safety and have the skills to keep them safe in aquatic environments. Our campers participate in daily American Red Cross lessons, led by certified instructors and supervised by Lifeguards. Lessons are offered for all levels – complete beginners to swim team stars, and everyone in between. Each summer, we go above and beyond to ensure that our waterfront staff are well-trained and prepared to run a tight ship. All of our lifeguards are trained in-house by Co-Director Liz Schwartzer, who is an American Red Cross Lifeguard Instructor and has worked in camp aquatics here at Quinebarge since 2010. By training our own staff, we ensure that they meet skills requirements and are knowledgeable about our specific facility. We also hire Red Cross Water Safety Instructors, and provide training for those who come in without the certification. Sports (baseball, soccer, basketball, Gaga, volleyball, badminton, floor hockey, lacrosse, cricket, disc golf, Quidditch, ultimate Frisbee, rounders, and more! 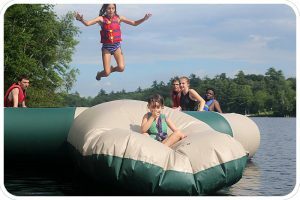 Additionally, campers have 90 minutes of free swim daily, when they can put their new skills to use while having fun with their friends – which is the heart of what we do. Our focus for campers goes beyond learning new things and building skills – having fun and making friends are the most important things they do. Whether campers attend for two weeks or all summer, they will go home with happy memories and friendships that will last a lifetime.